Cassina continues its re-discovery of the authentic masterpieces of the great masters by identifying the first versions designed by Le Corbusier, Pierre Jeanneret and Charlotte Perriand for the Salon d’Automne of 1929. 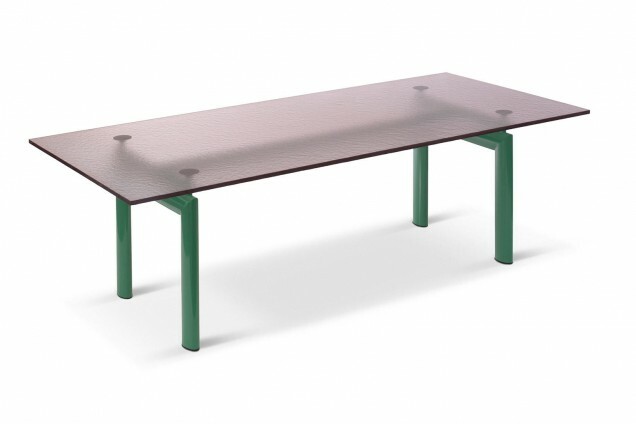 The LC6 table was presented at this event as a first study model with an rose glass printed top and green base and was subsequently developed by Charlotte Perriand with a blue top and ivory colour base. Finishes: rose-grey thermoformed glass/ steel frame painted shiny green.